Let me tell you a story about a man named Mike. Overwhelmed by components, can't believe marketing claims. And then one day while surfing on the net, up came a page with an interesting claim... Knowledge that is. Reference material. 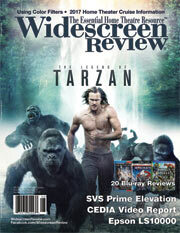 Widescreen Review. Well, the first thing you know old Mike's signed up. Getting monthly coverage and in-depth reviews. He thought Widescreen Review is what we all should read. So now I'm reading Joe Kane and spouting ISF calibration, that is. Image quality. SMPTE bars.